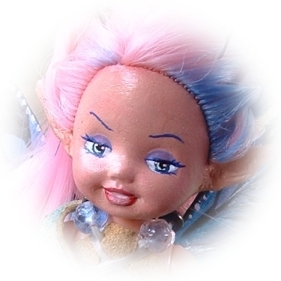 Presenting Eradea, Wee Pixie of Mischief and General Pranking (for fun, of course). When you can't find your car keys.... when change disappears from your purse... when the cat sings all night without pause.... that might be Eradea making her rounds through your neighborhood. 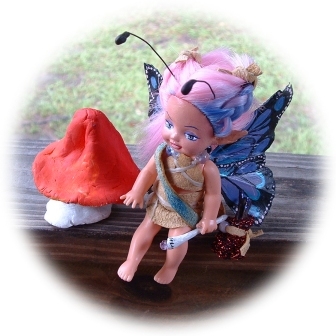 Hair styled, face fully repainted, hands and legs reshaped, wings ears and antannae added, mushroom sculped, & outfit hand-created by the artist.